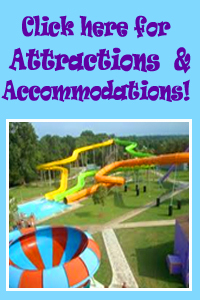 Slips can be rented daily or annually. We have UNCOVERED slips available for daily rental, THESE SLIPS ARE $23 PER DAY OR 10 DAYS FOR $207. RESERVED SLIPS ARE NON-REFUNDABLE! Rates for annual slips vary by size. 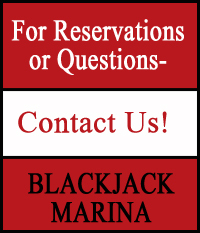 Please call 573-565-2233 for current slip availability and pricing or to reserve a daily slip. A two night minimum on reserved daily slips and a three night minimum on holiday weekends. Our current gas prices are: $3.29 for regular and $3.49 for pre-mix. We are a dealer for Drew Boat lifts of Camdenton Missouri. Early Spring Store hours 8am-4pm Everyday! 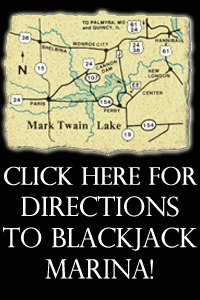 Blackjack Marina offers a Convenience Store and Restaurant (Seasonal). Eat in the restaurant or outside under our covered patio area. The restaurant is now open 7 days a week, 11am – 7:00 pm. We are serving breakfast, Saturday, Sunday and Holiday mornings, 7am – 10:30 am. During early spring and in the fall, we are offering a deli sandwich special. During our summer season, we will be serving a full menu for lunch and dinner during the week, and breakfast, lunch and dinner on weekends.